Vincent Meens is a spacemodeler of very high regard, worldwide. 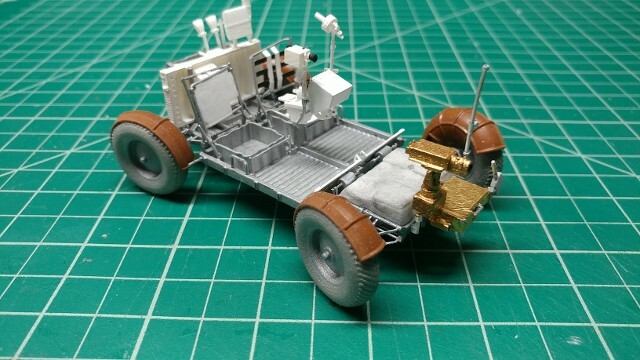 He has built some very impressive scratch-built models of various spacecraft over the years and has recently taken his work on a high-resolution, 1/32 scale model of the Apollo Lunar Module, the Apollo 11 LM-5, originally, and began to create 3D modeled renderings of all of the major parts of the LM, so that other modelers could order them through his store-front on Shapeways.com and build their own version. That original work has now blossomed into LM modeling parts ranging from 1/48 scale (the old Monogram & Revell scale) up to 1/6 scale (!). 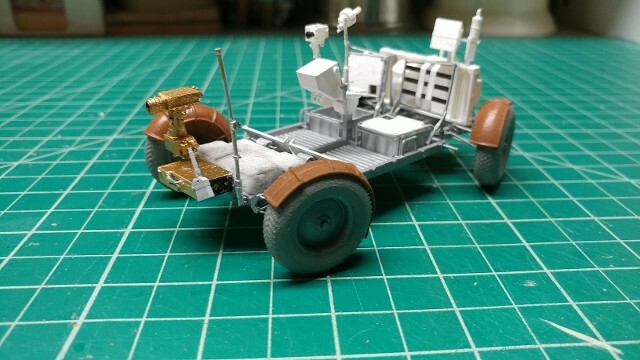 Vincent has also added parts for other models, such as the Apollo Command & Service Modules, lunar surface experiment items, the French Diamant rocket, the Soyuz Spacecraft, and now, the Apollo Lunar Roving Vehicle, from 1/48 to 1/6 scales. 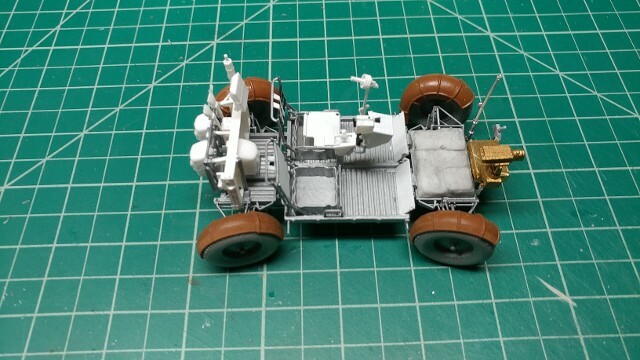 We chose to do a 1/32 scale LRV to work with other major Apollo models we have already done. I knew the design and print quality would be excellent, as I had purchased parts from Vincent though Shapeways before, to augment our build of the Edi-Ct aft 1/32 LM-5 model. The instructions on how to put the sections of the LRV model together are down-loadable from Vincent's own Space Modeling web site. They are made of a set of JPG images, with no text. So, as you might imagine, they are pretty self-explanatory. The image above was taken after all of the major assembly work was done. 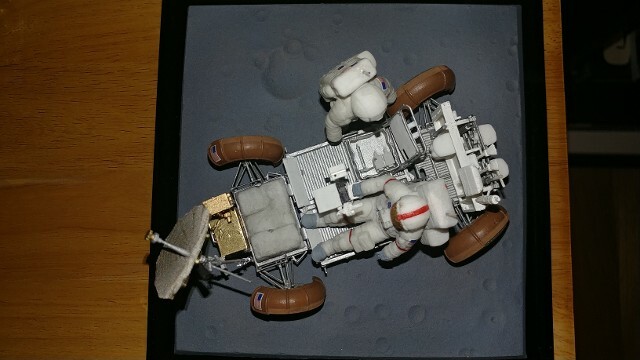 We chose a model that was in a right-hand turn, withthe pallet tools intended to represent those used by the Apollo 15 crew at Hadley Rille. The right-side seat is raised up, to show where the storage location was under the seat. The Sequence Camera and Low-Gain Antenna have been assembled onto their support points on the Control Console, and the TV Camera and accessories have been installed on the front, but the High-Gain Antenna has not yet been fabricated. There is a cleaning brush mounted on the left-front corner of the LCRU, which was used to clean the TV camera lens from lunar dust accumulated during the traverse. We then got a couple of different sizes of stainless-steel screen mesh, to see which one would look and work the best to fabricate the High-Gain Antenna. The antenna "form" is placed on a piece of foam board or cardboard, so I could form the metal screen over the curved surface, using modeling clamps to pull it down tight. Once the curve was set, the antenna's "spider" was lightly coated with ACC on the inside surface of the ribs s and the n placed in position over the formed mesh. Once set, the mesh and ribs were removed from the form, the excess mesh was cut away, final gluing was done. After setting, the antenna ribs were painted gold and the mesh was tinted gold with a Sharpie. After the feed horn was placed onto the antenna and painted, the complete assembly was mounted onto the support tube. 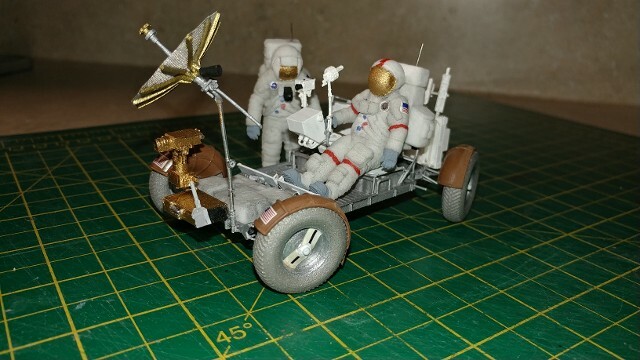 We had also purchased a set of Apollo EVA Astronaut figure through Max Gruer's Shapeways webstore. We decided to put the CDR in the seated driver's side position and have the LMP pulling his rock hammer out of the under-seat storage to begin a new location stop. We also created a "wash" using ground graphite from a drafting pencil and traces of dissolved Flat Black Acrylic Paint in denatured alcohol, to simulate "moon dust." We brushed thin layers of the wash over the legs and sleeves of the space suits and the backpacks to give them a more used appearance. I had some suit decals left over from the New Ware 1/32 scale Apollo Astronauts, but we scanned them, created new flags, NASA meatballs and crew flight patches to finish the work. We also made US Flag decals for the LRV fenders, a Control Console Panel decal to make that part look more realistic and the "rotation markers" that go onto the Rover's wheels. 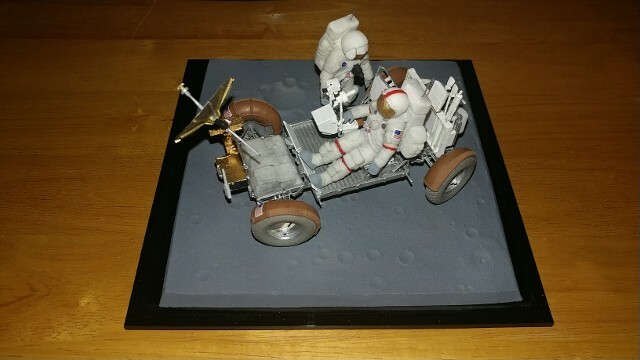 In order to add even more realism to the display, I ordered a resin "moon base" display platform from Alan Urey of Fantastic Plastic. 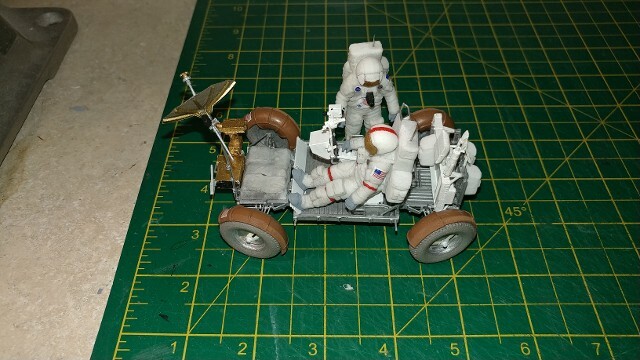 It was the same base plate sold with the 1/48 scale Soviet LK Moon Lander. It was just the right size for the 1/32 Meens LRV. Many thanks to Vincent Meens for his incredible 3D rendering, which allows us, and many others, to realize these impressively accurate models of America's Moon Machines.